+2/+0 while you have the most creatures in this lane. Snow Wolf is a rare Willpower creature card. It is part of the Core Set. In addition to the card's availability in the Core Set, one copy is obtainable in the Band of Survivors deck as a potential reward from The Hungry Pack. 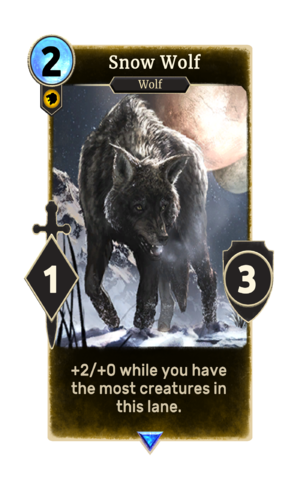 This card's ability applies the Howl of the Wolf card effect. The effect is already active when played, but without the buff. When the buff triggers, the effect is applied for a second time.